I am so thrilled to see a Pileated Woodpecker return to the same tree they nested in last year. It's adjacent to our house so we can sometimes even see one out our window. The best view is from the street though, which is where I shot these. Last year they nested on the opposite side of the trunk so the only way to see the nest hole was from the neighbors front lawn. It was no problem considering no one was living there. This year some people have moved in and they aren't the friendliest. Luckily the bird is making a nesting hole on the side by the road! I'm not sure if there's a female or not. I'll have to keep a look-out in hopes that there is. I video'd for quite a while hoping to catch him making his call. He never did. Until I walked away that is. If you'd like to hear what we've been listening to each morning, the drumming and the calling, click HERE This one is not my video. *I'm glad so many of you enjoyed the Vermont farm photos. I loved taking them! By the way, I'm definitely no farm girl either! Flies and I don't mix. Great shots of the woodpecker. You should link to outdoor Wednesday at Asoutherndaydreamer blog. Loved the video, loved the photos, your talent is just amazing! I heard but didn't see one the other day. Love that sound--both the knock, knock and the laughing call. It gives me a thrill to know they are still around, doing their thing! I am glad Mr. Woodpecker was cooperative and let you get such great shots of him. All your pictures are very good and I enjoyed your blog. How marvelous, but I'm so jelous. I have never seen a pileated and have always wanted to see one. Great pictures and video. Hope misses comes along soon. Enjoy. Lucky you to have this beautiful bird in your area. These are fantastic captures. I had an unusual bird visit this week too! Great video you shot, Sharon! As you know, it's my favorite bird and wow... is he busy or what! Hope a female shows up. I read a blog earlier today, a gal here in Virginia that found an injured Pileated and got it to a bird rescue place. It had an injured wing when she found it on the ground and he's in good hands now. They are such great birds -- I've gotten to see them up close and personal -- they are amazing! Pileated woodpeckers are my favourte! They visit around here and are noisy as heck :) but I enjoy them anyway! Nice photos! I'm amazed at how big he's made the hole in the tree! He's a very industrious woodpecker! WHat a beautiful, colourful bird. We used to have one in a tree near a house I lived in. I really enjoyed it. To bad about not friendly neighbors. Maybe they will warm up with the weather. We New Englanders are always friendlier in the summer. Cool video Sharon. Super views of the male nest building. Hope they have a sucessful breeding season that you can follow. Having checked the link, that call is definitely unmistakable. FAB. Sharon, what amazing photos! 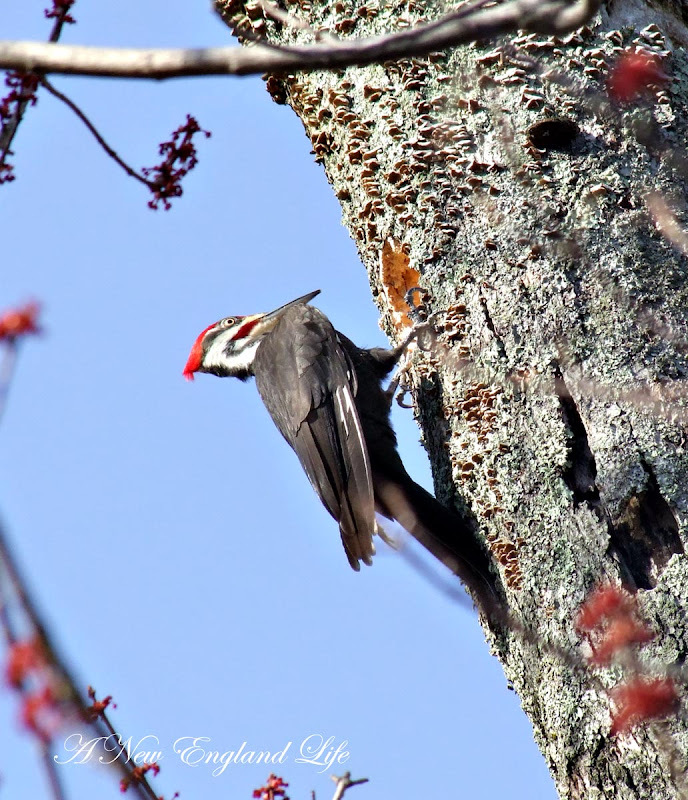 I have seen downy woodpeckers in my backyard, but never a pileated. He's beautiful! 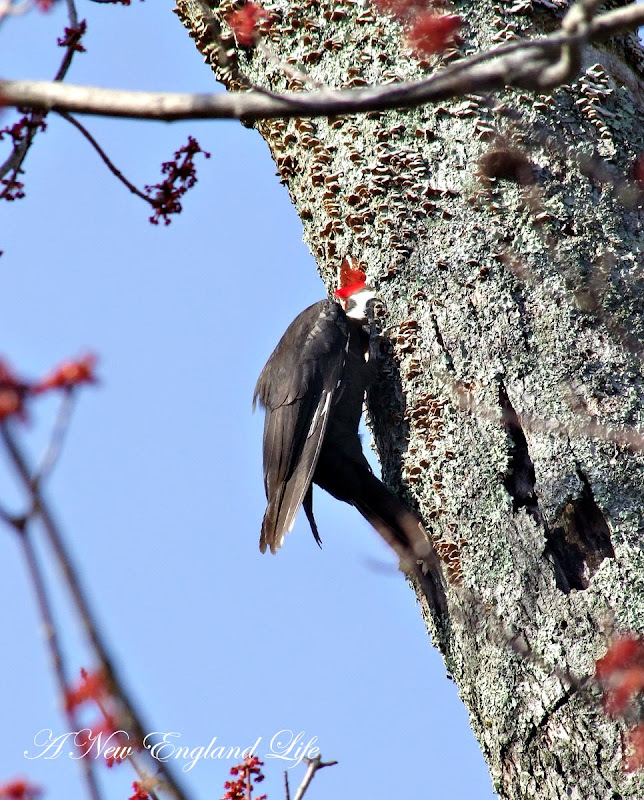 We have a pileated woodpecker that hangs out near my home in the woods. Such a handsome fellow! Love it. Almost as good as a rooster. *smile* So pretty with the shock of red feathers on its head. 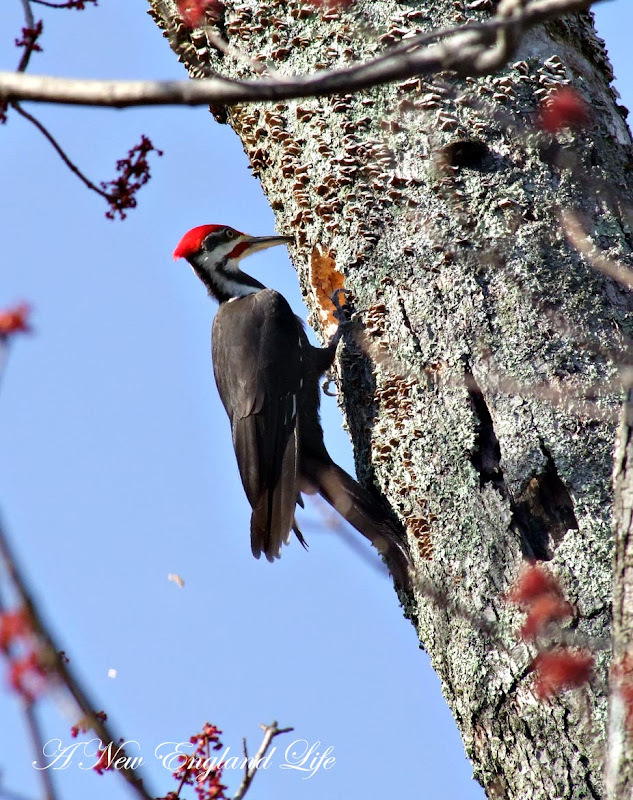 Great pictures and video of the Pileated Woodpecker. Happy for you that he choose to make his home roadside as opposed to the side with the unfriendly neighbors! Your photography is outstanding. These are amazing shots! I really enjoyed seeing this so much. Thanks for sharing! Hope you'll visit me as well...I'm also having a $100 giveaway! What fun! Your photos are lovely. Thank you for sharing this. Your photos are great and the video was such a treat to watch. Absolutely AWESOME. I think we have some in our neck of the woods too - never really see them, but hear them. Great photos of the woodpecker... I enjoyed them! I have some kind of woodpecker in a tree in my garden. He sure makes a lot of noise, but I don't mind... I like watching him too. Lily, I hope you don't mind that I featured your lunch at Petey's on my blog Daily Vitamin Sea. It looks like such a fun nautical place! I live in the tiny coastal town of Tiverton, RI..., and have been in New Hampshire once. I'm glad that I found your blog!! Am enjoying your photo series from the farms for spring. Great job by both of you Sharon! I love the still shot with the wood chips flyin!! I've got them here in my woods but don't get to see them all that often. Thanks!!! Wonderful, gorgeous shots, Sharon! I am so jealous...we have them here but they are very shy and rarely come out of the woods near houses for me to catch them on camera. I LOVE them..they are SO huge and awesome! A couple years back we had a pileated visit. It was when i was just getting into photography so my pictures were too great. I have been waiting for its return. I did get a blue heron in my yard this week though! That was exciting. Always a pleasure to visit your site! How funny! I'm no farm girl either but, somehow, I live on a farm and apparently am married to a budding farmer and love those chickens (and Jack the cuddly rooster) and can't wait for sheep and puppies are coming in under two weeks. I HATE all of the bugs out East. Happily, I love Vermont! Oh, bother, I forgot what I was going to say. I remember! We too wake up to silly woodpeckers banging on the metal roof of the big shed! You'd think that by now, he'd have figured out it's not hiding any bugs. Maybe he's trying to impress the ladies. We saw our pileated last weekend, Sharon! Of course, he is always too far away in our woods to get a good picture. These are spectacular! I love seeing the woodpecker, they are so fabulous! He's so fascinating! I love beautiful birds. We don't have woodpeckers out here in SoCal. But we do have lots of pretty hummingbirds. I was so excited to see the pics AND the video! I would love to have a next of this bird near my house! That hole is quite big that he is making! He sticks his hole head in it! LOL! I truly enjoyed the video! Thanks for sharing it! We have one around here so I know this sound well. In fact, we love this sound. Great captures of this bird, Mary! How lucky. Oh, and thanks for the link to the sounds. That was so interesting. Thanks for sharing. They are such fascinating birds. I've never seen one in action.